The Rebel Sweetheart. : Foodie Goodie | Hummingbird Nests. Admit it, you missed my Foodie Goodie Friday posts. I missed it, too! I've been swamped with products reviews and blog campaigns lately that I haven't had the time to tinker in the kitchen or cook a proper, full-course meal. Anyhow, I'm squeezing in this quick food post because a reader sent in a request for an Easter recipe. This recipe is a quick one, too. But you'll have tons of fun making it with your child. Enjoy! 1. Melt the chocolate chips, following the directions on the bag. 2. When the chocolate is smooth, stir in the coconut. 3. Drop the mixture by the heaping tablespoon onto waxed-paper-lined cookie sheets. 4. While the 'nests' are still warm, use your thumbs to poke an impression into the middle of each. 5. 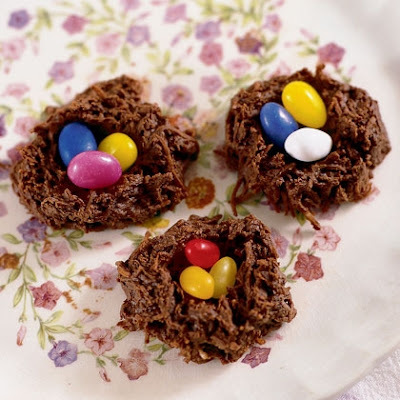 Allow the 'nest' to cool, then fill with egg-shaped candies. Shared with Food Friday, Food Trip Friday, Heavenly Treats Sunday. oooh, so cool! fun and yummy! These are fabulous! I'd like to invite you to participate in my Pin Me Linky Party. It goes Fri-Tue. I allow up to 3 links each week! I'm a new follower! Wow Kids would really love to have this hummingbird nest... Oh wait, I think even adults like me would love this. I like these! I think I will make them! looks really yummy, my daughter would surely love this, i hope i can get a time to do one. It's looks so yummy that can't even guess how tasty it would be,very nice. So easy. We'll definitely try this. Thanks for sharing. Looks like the kids will enjoy this. This is sosyal na "bukayo". Look yummy! The kids will surely love them!! my kids would eat these up!!! Looks easy and good! Did you ever try this with something else instead of the coconut? Just wondering because I don't think my kids would go for the taste!